When I first opened up and started working with the fighters who came from next door, it was a huge question mark: How do these guys need to be trained? What were the differences between what they needed and what I was used to, which was football and strength and power; make guys big and strong, fast and explosive. That was what I knew how to do and that was what I focused on. Then, I went next door and started training with them a little bit. I was really strong and kicked their asses for about 10 seconds . . . and then they murdered me because I had no endurance. I was strong and powerful, but I couldn’t make it last more than 30 seconds. That was when I started to realize that there’s a whole different ball game between one sport and the next. There’s a whole different set of needs that one athlete has compared to another. Today, we’re going to talk about what the Performance Model is and then I’m going to give you some sample models of how you can actually take Excel and use it to create models and give yourself a tool to track and monitor and see where one athlete stands when compared to another, and what they need based on that. Finally, we’re going to talk about how to use the whole thing put together. First of all, what is the Performance Model? The Performance Model is probably going to be different to each one of you, because each one of you is going to have somewhat of a different take on performance. Charlie (Weingroff) has his views on performance, Patrick (Ward) has his views and I have my own. There are a lot of similarities: we all see a lot of the same picture, but we’re all going to define things somewhat differently. And that’s okay. We’re all going to have a slightly different approach to training based on our backgrounds, based on our expertise and our experiences. But the Performance Model is something that doesn’t have to be the same thing to everybody. We can all have our different takes on it. We can all have different view on how to put it together. At the end of the day, we all want to have something to compare one athlete to and figure out what they need. 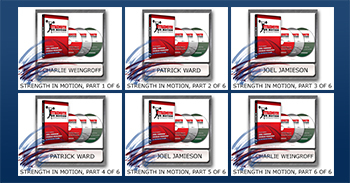 Every effective training program starts with an assessment of the athlete’s strengths, weaknesses, needs and goals. Measuring heart rate variability is a non-invasive gauge of the autonomic nervous system. It's a technology that's now available at an affordable price so coaches and trainers can use it to monitor an athlete's training and recovery state. Joel Jamieson, a strength coach who works with a variety of athletes, explains heart rate variability in this lecture, and describes how he uses it to guide his training programs both daily and over the long term.